This dish is for the meal adapted to a Ketogenic diet. Normaly I would use hoisin sauce in a vegetable dish like this. Today I am only planning to use soy sauce and chili garlic sauce and to spice it up at the end with some Sichuan pickle. To give the dark greens some color and variation, I am adding bamboo, carrots, and Chinese celery. Chinese celery is closer to wild celery. It is thinner and more strongly flavored than European celery. It is almost always cooked before being eaten. My daughter Miriam introduced me to a vegetable shredder. Have you have ever been to a Japanese restaurant and seen these long strings of daikon radish and carrot and wondered how they get such perfect cuts? 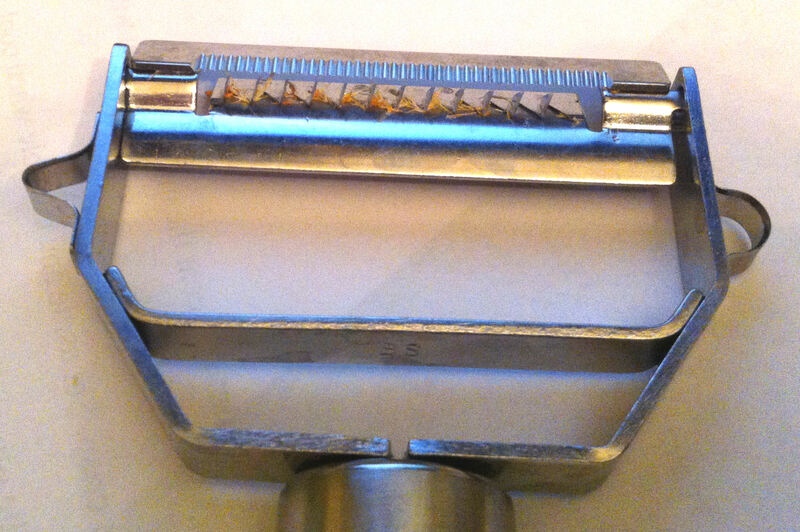 This is the simple device that makes those cuts. It is basically just a potato peeler with vertical blades every 1/8 inch. You simply drag it along and you get perfect 1/8 x 1/8 inch strings the length of the vegetable. 1. Rinse and trim the Chinese broccoli. Shred the leaves and set them aside. Cut the stems into 1 to 1½ inch pieces. Cut any very thick stems in half or thirds lengthwise. Set them aside separately. 2. 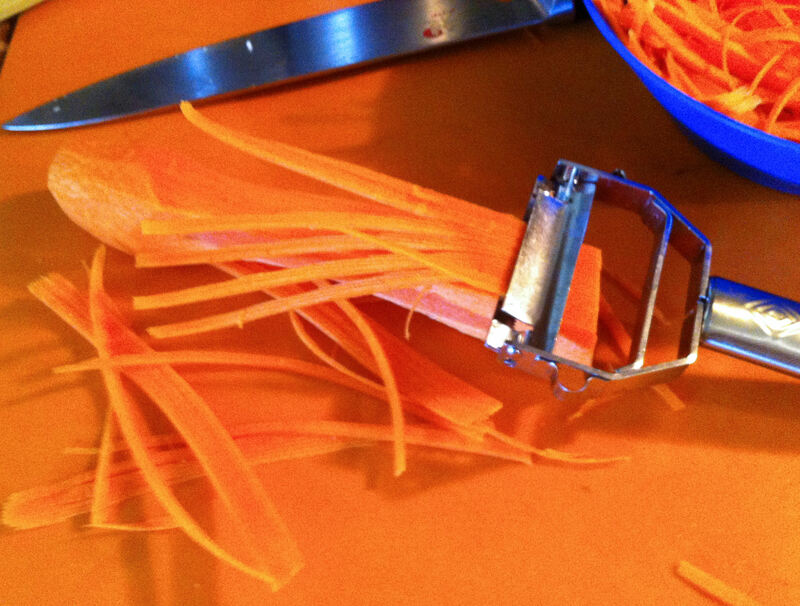 Shred the carrot and set the carrot strings aside on a large plate. 3. Rinse the Chinese celery, cut the bottom half inch off of each bunch and chop them into 2 inch pieces. Set them aside on the large plate. 4. Slice the bamboo and garlic and set them in piles on the large plate. 5. Measure the sauce ingredients, put them in a small cup and set it aside. 6. Put the canola oil into a large wok or skillet and bring it up to a high temperature. Add the Broccoli stem and toss the vegetables about every 30 seconds for 3-4 minutes. Do not stir constantly. 7. Add the carrot, bamboo and celery to the pan and continue stir-frying for three minutes. 7. Add the garlic, shredded Broccoli leaves and the Sichuan pickle. Continue stir-frying for one minute. 8. 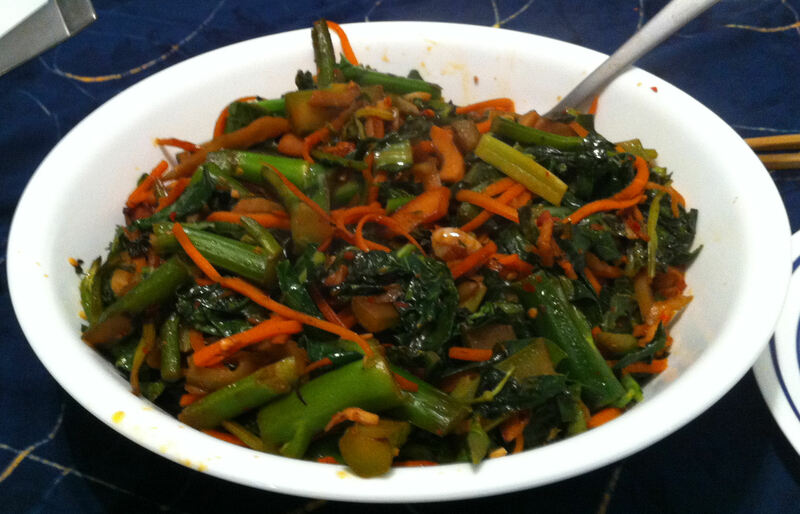 Pull the vegetables to the sides of the pan and pour the sauce mixture into the open space. Mix the sauce together for about ten seconds and then toss the vegetables to coat them with the sauce. 9. Remove to a bowl and serve immediately.